I for one am just about tired of hearing from the talking heads whether on TV, Radio, or in Print say that America needs put “boots on the ground” to fight and defeat ISIL/ISIS/IS. These talking heads fail to realize or do not care that each pair of boots will have one of Americas best standing in them. The one standing in those boots will be someone’s son or daughter, someone’s grandson or granddaughter, someone’s father or mother, someone’s husband or wife, someone’s cousin, niece, nephew, or friend or even someone’s grandfather or grandmother. Why in Gods name would these blowhards even suggest that America’s best be sent into harms way while at the same time saying that there is no clear plan to defeat ISIL/ISIS/IS? If there is no plan to defeat, there is no plan to win. Are they actually suggesting that more of America’s best be wasted? Are they suggesting that more American service members be sent into yet another “meat-grinder” without the administration having the apparent will to win? The possible reason that the term “boots on the ground” is so popular with the talking heads is that it removes the human from the equation. After all the boots are not the son or daughter of anyone, nor do boots have brothers or sisters. Boots have no family or friends at all. Boots are just inanimate objects. Putting boots on the ground will accomplish nothing, it takes a Human wearing those Boots to accomplish something. Boots can neither act or think. It is highly unlikely that the boots will feel any pain, but the human that wears them will, if only for a moment. Boots can not scream out in agony nor will they call for their mother, that again takes a human wearing those boots. Unless these talking heads are willing to go to the Armed Forces recruiting station and sign up. Better yet, these same talking heads should take their own sons and/or daughters down to the nearest Armed Forces recruiting station and sign them up. If these talking heads are unwilling to do these things, they just need to shut the hell up. In other words “put up or shut up”. The talking heads in the media are willing to spend(waste)the lives of sons and daughters the same as politicians are willing to give away money. The politicians will give away all the money of other people, but not theirs. The talking heads are willing to waste the lives of the sons and daughters other people, but not theirs. Would the talking heads be so vocal about putting boots on the ground if their sons or daughters were wearing those boots? My thoughts and prayers go out to the victims and their families in the wake of the horrendous terrorist attack in Paris on 11/13/15, a terrorist attack carried out by radical Islamic extremists. Given what happened in Paris on 11/13/15 I have to wonder why the refugees are still being allowed entrance into the countries of Europe and especially wonder why in God’s name are the refugees from Syria and Iraq being allowed admittance into the U.S. This is especially troubling since some in our own government have openly stated that terrorist are most likely blending in with the refugees. Is the U.S. government taking, not just taking but accepting the risk that a few radical Islamic extremists may infiltrate the ranks of the refugees? As we saw in Paris on 11/13/15 the actual attack was conducted by just a few radical Islamic extremists. The same as America witnessed on 09/11/01 with the radical Islamist attack, the actual attack was carried out by fewer than twenty. The Paris attack was carried out by fewer that ten. The attack at Ft. Hood was carried out by one. The attack in Chattanooga was carried out by one. How many were involved in the Charlie Hebdo attack, Two? The large-scale and coordinated attacks require planning and logistics with many people operating in the background, the so-called lone wolf attacks do not. The only thing the two have in common is picking the right target. It does not take a lot of radical Islamic extremists to cause great amounts of death and destruction sometimes as few as one is all is that is needed. My question for the government is what is the acceptable level of risk for your refugee resettlement program? Is the government inviting disaster? Is government willing to risk and accept that 1 out of 100 is a radical Islamic extremist? 1 out of 1000? 1 out of 10,000? Remember what one at Ft. Hood and one in Chattanooga were able to accomplish. When I hear that you will have a “robust vetting process” in place it does little to bolster my confidence. My guess is that you are gambling, playing the odds, with the lives of Americans, hoping for the best. Even one radical Islamic extremist is one too many. BHO had claimed that ISIL(as he prefers to call them)are contained. Then Paris happened. BHO said that was a minor set-back. BHO may have been correct when he said that ISIL was contained. The policy of “containment” has been a success. ISIL(as BHO prefers to call them), their affiliates and their sympathizers are contained on six out of the seven continents, unless they have an affiliate branch in Antarctica. For arguments sake, let’s say that by some major miracle the government gets this one right and no radical Islamic extremists arrive with the refugees, the government is still flirting with disaster. The disaster facing America in this case would be a financial disaster. Resettling refugees costs money a lot of money. At present the plan for resettlement is to accept and resettle 10,000, I suspect that many more than 10,000 will be arriving. Since they will be arriving without much in the way of finances or belongings they will be provided with the necessities of life and in many cases the luxuries of life. They will need housing, food and clothing at a minimum. All of that costs money as said a lot of money. The money to pay for the refugee resettlement must come from somewhere. The somewhere is actually somebody, and that somebody is the American taxpayer. I have to wonder where and when the “robust vetting process” will take place. I suspect that the vetting will be conducted upon arrival in America. My question at this point is this. What would be done when a known radical Islamic extremist is found amongst the refugees? Would he or she be sent back to their home country? Would he or she be tried and imprisoned or simply held in the prison system? It seems that the terrorists operating outside of the Middle-East and North Africa seem to have a tendency to pick “Soft Targets”. The best definition of a “Soft Target” is one in which the terrorist will face the least resistance, meaning an unarmed civilian population. An area where the only protection comes in the form of government forces, whether it be Law-Enforcement of the Military. France itself is not a “soft target”, but the people are as is most of the civilian population of Europe as well as the places they frequent. Most any place the people of Europe frequent is a “soft target”. Getting to the question of would or could America face the same kind of attack experienced by Paris for a moment, and the answer of it is not a matter of if but when. This is my feeling on that issue. The same thing that was credited with keeping the Japanese from invading may be the same thing keeping the radical Islamic extremists at bay. And that is a citizenry with the Right to Keep and Bear Arms. Whether or not the right is exercised it does place a feeling of doubt in the mind of criminals as well as terrorists. Make no mistake the radical Islamic extremists are here, waiting, and more may be arriving with each batch of refugees and they too may wait. But waiting for what. Could they be waiting for sufficient numbers to wage a large-scale operation? I already pointed out that very few or even one can cause large-scale death and/or destruction. Could they be waiting until the gun control groups finally achieve their goal of a totally disarmed civilian population? I think the latter, just waiting for a “soft target”. At this point America itself is not a “soft target” and neither is the population. Just imagine, if the gun control groups and the politicians got their way and somehow managed to disarm the civilian population, what would happen. First off America is a large land mass, if the population was disarmed either voluntarily or by force there is no way that the federal, state and local law-enforcement agencies could patrol the entire country and provide safety for the population. Even if the military was included it would not be enough. Government, Law-enforcement and the Military would be occupied just protecting large cities and critical infrastructure and would barely be able to do that, those of us in the rural areas would be on our own and at the mercy of the terrorists. The rural areas would be given up as most would migrate to the large cities just for some protection. The cities would not be capable of supporting the entire population of this country. America would be a “soft target” from coast to coast. If the situation were reversed and America found itself in the same position as the middle-east where could the Americans flee too? It is highly unlikely that the countries of the middle-east would accept American refugees. There would be no refugee activists waiting with open arms to welcome anybody. It would be best and even considered wise to close the borders. America must consider America first and stop taking un-necessary risks. There is nothing wrong with helping others but you must take care of yourself. No one has ever been helped by the helpless. The possibility of even on radical Islamic extremist making it to America is not worth the risk of taking in refugees. The government must stop inviting disaster. As I mentioned America and the American people are not soft targets but there are many soft targets in America. 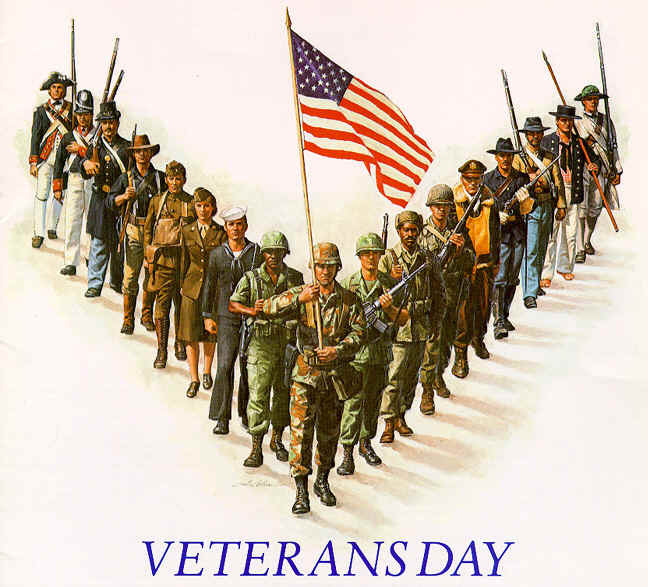 Today is Veterans Day, a day to thank all Veterans who served their nation in times of peace or war. 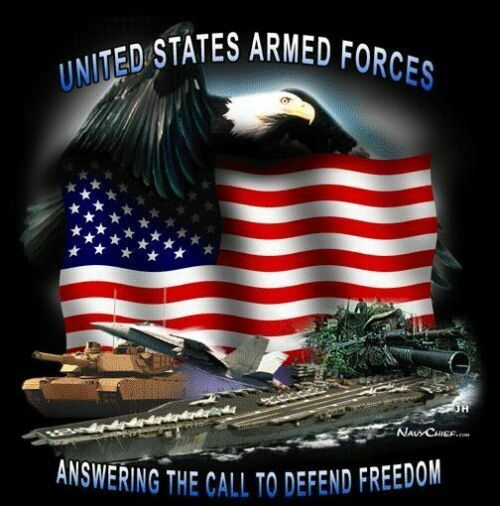 I send out my heart-felt thanks to all my brothers and sisters in arms, and to each and every one of you I say you made a difference when a difference needed to be made. It does not matter which Branch you served in, it matters that you served. It does not matter if you were drafted or volunteered, when the nation called you answered, many answered without being called. Today is also a day where the rest of America should look to the veterans as an example of togetherness. We do not divide ourselves into different classes, nor do we allow ourselves to be divided. We do not have a day for white veterans, black veterans, brown veterans, red veterans or any other color imaginable. All of that was put aside, we are all one.